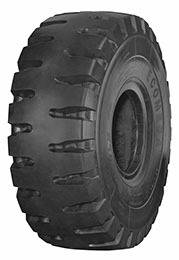 ECOMEGA M5DLX is a premium radial tyre which provides excellent stability and resistance for severe loader applications. The casing is a reinforced 2* index. 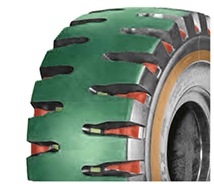 Very deep tread depth and shoulder protection to resist cuts and impacts. The solid centreline section guarantees a long wear and a smooth ride and is ideal for high torque applications and hard rock quarry service. Large footprint area and maximum operator and vehicle protection. Ideal for extra heavy duty loader performance. Excellent productivity and low cost/hour.